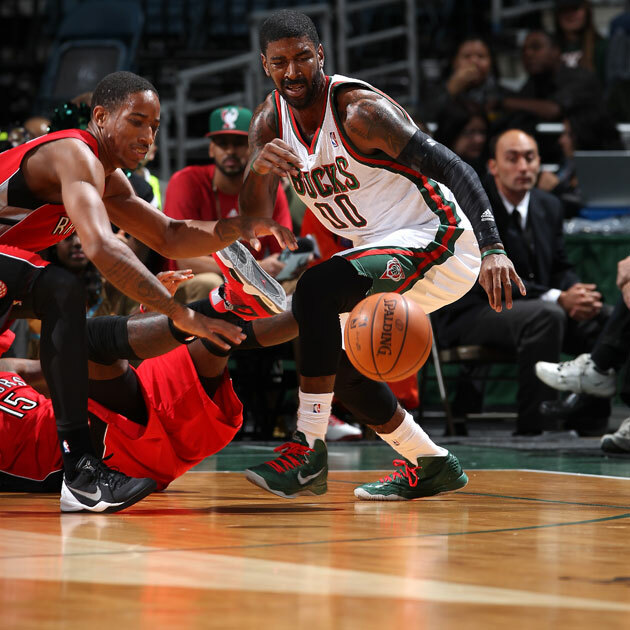 Following an embarrassing incident that forced referees into suspending Milwaukee’s final preseason game just a few minutes into the contest, the Bucks are taking a closer look at the slippery flooring that the Bucks, Toronto Raptors, and working refs found so dangerous last Friday. The famous Robert Indiana-inspired flooring, debuted to much acclaim in September, is being shelved for the time being. Probably a good idea, considering that four Bucks and Raptors players slipped to the floor in just six minutes of play in last Friday’s canceled exhibition turn. "The Bucks and the NBA share an unyielding commitment to player safety and agreed that the floor refinishing, which is expected to be completed in three weeks or less, is the best long-term solution," the team said in a prepared statement. "In the interim the Bucks will play on the team’s prior court, used by the team throughout the 2012-'13 regular season and playoffs." The Bucks unveiled the design last month at the Milwaukee Art Museum. The design was inspired by pop artist Robert Indiana's 1977 MECCA floor, and was a key part of the team's marketing efforts before the season began. The new court was created by Action Floor Systems of Mercer and assembled, sanded and painted on-site at the BMO Harris Bradley Center by ProStar Surfaces, a Mequon company that has worked with the Bucks for more than 20 years. In its statement, the team did not explain how the surface became so slippery, even though it had been used twice before Friday's exhibition game. Flooring experts, as well as officials from the NBA, inspected the floor at the BMO Harris Bradley Center on Tuesday. It’s true that Friday’s aborted attempt at a preseason game confused just as much as it worried the refs and players that decided not to follow through on the game. The new floor had been used twice in the exhibition season, once in a scrimmage open to fans and another time in a preseason contest against Charlotte, and Bucks guard O.J. Mayo (one of the players that fell last Friday) gave the court rave reviews. "It felt great," Mayo said of the previous games on the floor. "I thought we were pretty stoked on how the floor looks; it looks awesome. It doesn't have the shiny gloss. It has the mat look, how you see cars nowadays. "It looks awesome. We've got one of the best-looking floors in the NBA. Tonight it didn't work out for us. But I think we will definitely get it under control." Though Milwaukee opened its season in New York on Wednesday and again plays on the road against Boston on Friday, the rest of November will see the Bucks home in eight out of their 13 contests. Fans that missed out on watching the team for a full game on Friday were offered a free ticket to a home game in November as a make-up gift, and while it’s the players they’re truly out to see, it’s possible that none of those November make-up dates will feature the new floor. Good thing the last floor Milwaukee used was pretty good-looking as well. And that one didn’t knock people to the ground.